Quilt, Knit, Run, Sew: A Gift for Me! I've taught a couple of wallet classes at a local quilt shop lately. During the last part of the wallet class, we do some small measurements and markings that don't require a great big ruler. Well, one of the students had this little ruler. 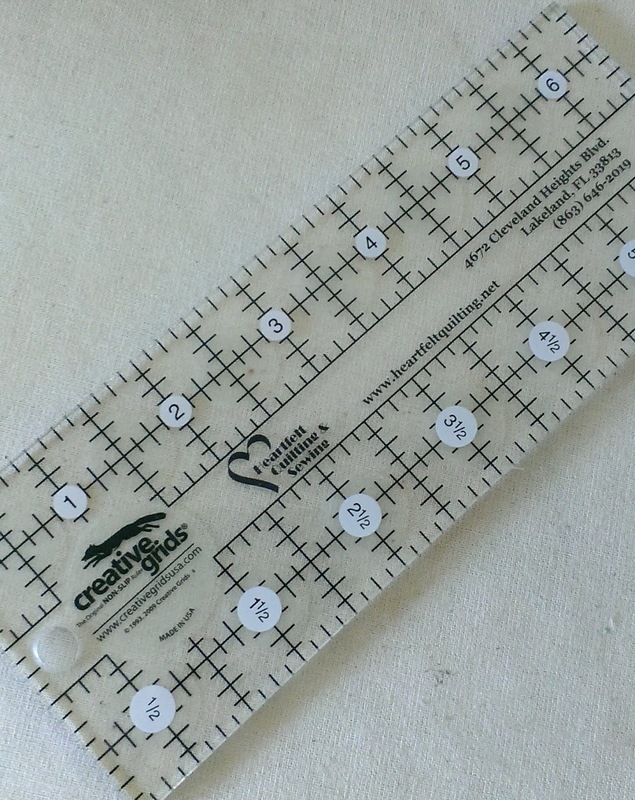 It's a creative Grids ruler that is 6" x 2.5". It's the nicest little ruler. Well, at the worktable, we all used her sweet little ruler during our final measuring and marking. At the end of the class, and everyone had completed their wallets, we were packing up. Ann, the owner of this ruler, came to me and thanked me for the great day. With the ruler in both hands, she presented it to me for my teaching kit! I was so touched with her gift. It wasn't until I got home that I noticed that this ruler has the name of the quilt shop on it. Heartfelt Quilting and Sewing. Oh, my, that makes extra special and probably pretty rare!! Thanks Ann! This gift was so thoughtful, and I can't tell you how much I, and others will enjoy using it as we finish up the final steps of our wallets. It's a perfect addition to my teaching kit. 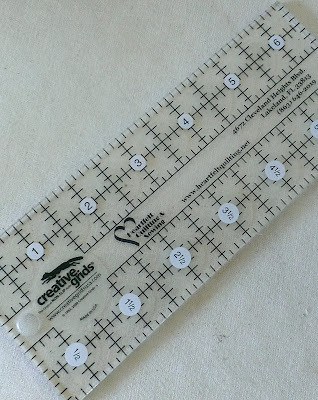 I purchased the same ruler at Heartfelt Quilting last winter. I love it. Looks like a great little ruler! I love my 1" x 6" Omnigrid ruler. I have not seen them here..must kkeep your/ my eye open!